Hard working and very job oriented, finishing the job is always the number one priority. Open minded and get along well with others. Always working hard to acquire new skills. Self motivated, always ready for a challenge. Use computers for various applications, such as database management. Create, maintain, and enter information into databases. Set up and manage paper or electronic filing systems, recording information, updating paperwork, or maintaining documents. In charge of Night Crew when Manager was absent. Supervise other staff and provide training and orientation to new staff. Train and assist staff with computer usage. Shape or cut materials to specified measurements, using hand tools, machines, or power saws. Measure and mark cutting lines on materials, using a ruler, pencil, chalk, and marking gauge. Install structures or fixtures using carpenters' hand or power tools. Verify trueness of structure, using a level. Build or repair cabinets, doors, using woodworking machines, carpenter's hand tools, or power tools. Assemble and fasten materials to make frameworks using hand tools and wood screws, nails, dowel pins, or glue. Finish surfaces of woodwork or wallboard in houses or buildings, using paint, or paneling. 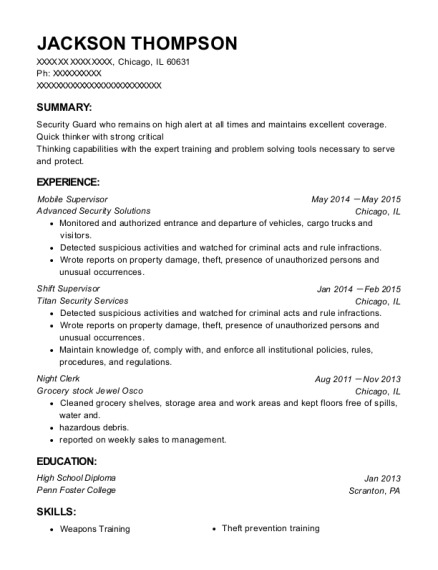 Perform minor plumbing and welding work. Demolition of floors and ceiling. Construct forms or chutes for pouring concrete. Reassemble machines after making repairs or replacing parts. Reinstall software programs or adjust settings on existing software to fix machine malfunctions. Test new systems to ensure that they are in working order. Update existing equipment, performing tasks such as installing updated circuit boards or additional memory. Disassemble machines to examine parts for wear or defects. Clean or adjust mechanical parts to maintain machines' operating efficiency and to prevent breakdowns. Lay cable and hook up electrical connections between machines, power sources, and phone lines. 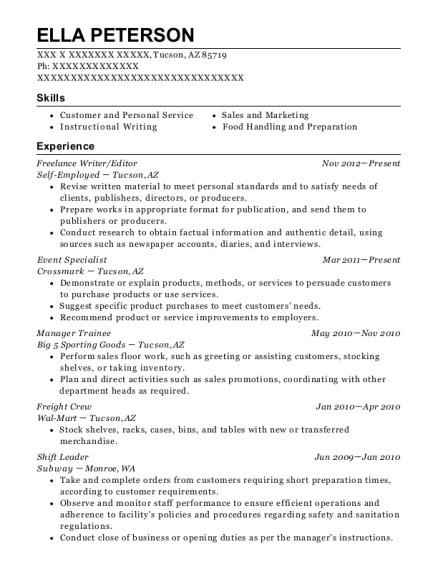 This is a resume for a Night Clerk in Owosso, Michigan with experience working for such companies as Kroger and Bob Riha. 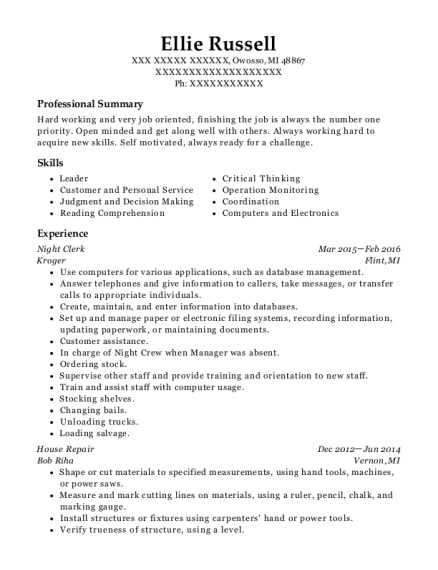 The grade for this resume is 0 and is one of hundreds of Night Clerk resumes available on our site for free. 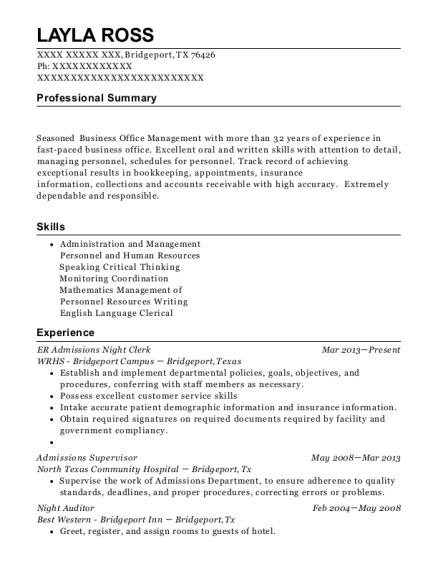 Use these resumes as templates to get help creating the best Night Clerk resume.